Dr. Shroff began his practice in 1914 and established Dr. Shroff's Charity Eye Hospital (SCEH) a few years later to enable people from all walks of life and all sections of society to receive quality eye care. SCEH has been known for both its high quality as well as the compassionate treatment it offers patients. The Eicher group started providing assistance to this hospital in 1996, supporting SCEH with funds and expertise and creating substantial growth. SCEH is one of the first eye hospitals to receive the National Accreditation Board for Hospitals & Healthcare accreditation in India. They recently established an ophthalmic assistant training program and are continuing to increase the number of patients treated at minimal or no cost. 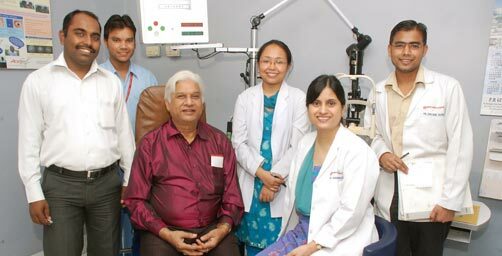 SCEH operates a tertiary center in Delhi, as well as four secondary centers and 21 vision centers under the values of patient first, excellence, passion, integrity and respect. SCEH joined Seva and the Global Sight Initiative in 2014 and began its mentoring with a focus on its own secondary hospitals before looking to work with other hospitals outside its network. Seva also supports SCEH with direct services through Focusing Philanthropy's World Sight Day campaigns and outreach and school screenings through the Bio Eyes Buy a Frame, Help a Child to See program.